Right-hander Ben Lively notched a highly successful season last year, helping to garner loads of attention as one of the Phillies' most promising young pitching prospects. 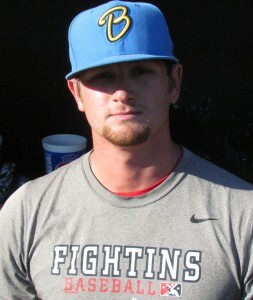 Originally selected in the fourth round of the 2013 draft, Lively would begin his pro career as a member of the rookie level Billings Mustangs in the Reds organization. In 12 starts that year the talented hurler posted a 0-3 record with a 0.73 ERA and an 11.9 K/9 mark. He was promoted to Class A Dayton to close out the season with a single start, allowing one earned run in four innings of work while striking out seven and walking one. This was fresh off his junior season at the University of Central Florida where, in 15 games, he went 7-5 with a 2.04 ERA and an 8.6 K/9 mark as the team’s ace. Lively would follow up his exceptional year by becoming the Reds’ minor league player of the year in 2014. Opening his first full professional season with Class A Advanced Bakersfield, Lively tallied a 10-1 record with a 2.28 ERA, a .201 batting average against along with a 10.8 K/9 mark in 13 starts. A stretch of 31 consecutive scoreless innings as a member of the Blaze got Lively some considerable attention and he was selected as a California League All-Star. In mid-June, he was promoted to his hometown Double-A Pensacola Blue Wahoos. There, he would sport a 3-6 record with a 3.88 ERA, a .232 batting average against and a 9.5 K/9 mark. On New Years Eve 2014 Lively was traded to Philadelphia for OF Marlon Byrd. After joining the Phils organization, he was assigned to the Double-A Reading Fightins' to open the 2015 season. The six-foot-four 190-pounder posted an 8-7 record with a 4.13 ERA and a 6.9 K/9 mark in 25 starts there. He missed a couple turns in the rotation in August with a shoulder strain. He would open the 2016 campaign back with Reading and his numbers there were gleaming. In nine starts, the 24-year-old tallied a 7-0 record with a 1.87 ERA and a .185 batting average against, showing he had nothing left to accomplish in the Eastern League. An overdue promotion to Triple-A came in late May. As a member of the Lehigh Valley IronPigs last year, Lively posted an 11-5 record with a 3.06 ERA and a .196 BAA in 19 starts. He looked excellent down the stretch, helping his club reach the International League playoffs, sporting a 1.66 ERA over his last seven regular season starts. A big key for Lively in 2016 was working ahead in the count, getting strike one consistently. The Florida native’s repertoire features a low-90’s fastball, a quality slider, a change up and a curve ball. The fastball plays better than the velocity can indicate, as batters don’t often see the ball well when Lively is on his game. All of his offerings come with a deceptive delivery which helps the young hurler and he proved to be very consistent with all of his offerings last year. Lively projects to remain a starter and should return to the IronPigs' rotation to open the 2017 season. A member of the Phils' 40-man roster, Lively will get a fair look with the big club in spring training. You can follow along with this year’s Phillies prospects countdown by clicking this link.